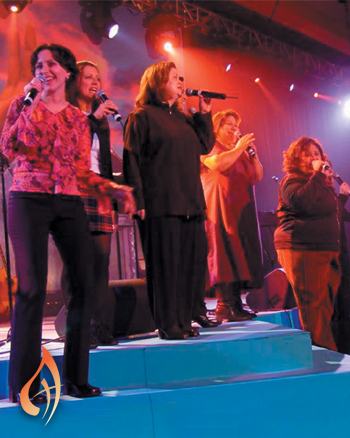 Daughters of God have shared their vital ministry with vast audiences. They have performed at many events, including World Youth Day 2002 in Toronto, the 2003 National Pastoral Musicians (NPM) convention in Cincinnati, the National Conference of Catholic Youth Ministers, and the Live 2B Holy Catholic Music Festival in Salem, Massachusetts, along with shows at various parishes, coffeehouses and colleges around the continent. Their fresh performances have moved audiences from laughter to tears and from dancing to prayer, and everything in between. The faces of young girls light up as they sing along with these inspiring role models. Mothers and grandmothers bask in the joy of recognition and solidarity as each Daughter shares her life story with the audience. There’s something about the Daughters that strikes a sincere chord with just about everyone. The Daughters of God are Sarah Hart, Wendy Andino, Nellie Cruz, Jessica Alles-Smith, Janèt Sullivan Whitaker, Jennifer Martin, Rebecca Harper and Susan HooKong-Taylor, all talented and established composers and performers. They live in diverse areas of North America, each deeply involved in music ministry, social justice work, ministry with women, motherhood, and other dynamic callings. After recording their landmark self-titled CD in 2002 the group made a commitment to sing together as often as their busy schedules would allow. Following in the footsteps of Rebecca, Elizabeth, Mary and other great women of faith, the Daughters sing a message of hope and celebration for the God who calls all people to holiness and life. Experience the joy of their upbeat music. Walk with the Daughters of God as they explore the spiritual journey common to all Christians.